« Want Your Kids To Lose Weight? Before I left the Mayo Clinic after my fellowship, the center was already into research regarding the efficacy of this ancient chinese remedy called the Acupuncture. It is one of the widely practiced alternative medicine in the US and therefore the National Institute of Health is also funding research into this area. It is one alternative therapy that does not entail any intake of drugs and therefore I bend a little and allow the use of this form of therapy among my patients. Yin represents the cold, slow, or passive principle, while yang represents the hot, excited, or active principle. According to TCM, health is achieved by maintaining the body in a “balanced state”; disease is due to an internal imbalance of yin and yang. This imbalance leads to blockage in the flow of qi (vital energy) along pathways known as meridians. Qi can be unblocked, according to TCM, by using acupuncture at certain points on the body that connect with these meridians. Sources vary on the number of meridians, with numbers ranging from 14 to 20. One commonly cited source describes meridians as 14 main channels “connecting the body in a weblike interconnecting matrix” of at least 2,000 acupuncture points. Whether the therapy really works for osteoarthritis to low back pain to diabetic foot ulcers remain to be seen. The NIH is already funding research into these areas and their conclusions are worth waiting for! For now… just like any alternative medicine…it is done at the patient’s will. It is not prescribed or advised but if asked then the doctor may tend to bend a little and allow this therapy to be done if other known modalities fail. 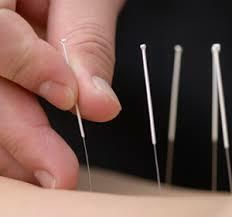 If Anything Else Fails..Try Acupuncture! This entry was posted on	March 6, 2008 at 10:16 am	and is filed under Medical News Bits, Personal Thoughts.